Bestselling author Delia Ephron shares a deeply personal collection of stories and essays, anchored by a loving remembrance of her sister Nora. 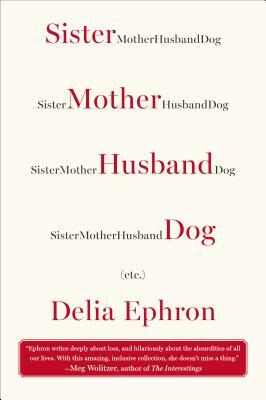 In Sister Mother Husband Dog, Delia Ephron brings her trademark wit and effervescent prose to a series of autobiographical essays about life, love, sisterhood, movies, and family. In “Losing Nora,” she deftly captures the rivalry, mutual respect, and intimacy that made up her relationship with her older sister and frequent writing companion. Other essays run the gamut from a humorous piece about love and the movies—how one romantic comedy completely destroyed her twenties—to the joy of girl friends and best friendship, the magical madness and miracle of dogs, keen-eyed observations about urban survival, and a serious and affecting memoir of life with her mother and growing up the child of alcoholics. Ephron’s eloquent style and voice illuminate every page of this superb and singular work. Delia Ephron is a bestselling author and screenwriter. Her movies include The Sisterhood of the Traveling Pants, You’ve Got Mail, Hanging Up (based on her novel), and Michael. She has written novels for adults and teenagers, including the New York Times bestselling Siracusa and The Lion Is In; books of humor, including How to Eat Like a Child; and essays. Her journalism has appeared regularly in The New York Times, O: The Oprah Magazine, Vogue, More, and The Huffington Post. Her hit play Love, Loss, and What I Wore (cowritten with Nora Ephron) ran for more than two years off-Broadway and has been performed all over the world, including in Paris, Rio, and Sydney. She lives in New York City.